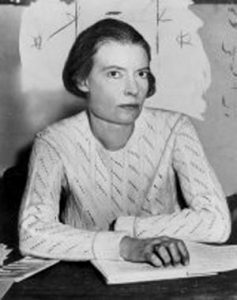 Dorothy Day (1897 – 1980) was born in Brooklyn, NY, and lived in San Francisco with her parents until the 1906 earthquake, and then in Chicago. Her father was a Journalist, and she was an avid reader. She moved to New York City as a young adult. From NYC, she went to Washington DC to work with the National Woman’s Party on women’s right to vote. She became a famous leader as a pacifist, a social activist, and for her work to improve the lives of the poor. She wrote for The Call and The Masses, and co-founded The Catholic Worker. Sources: Irwin, Up Hill with Banners Flying, Traversity Press, Penobscot Maine, 1920, p 280-281. Stevens, Jailed for Freedom, 1920.